Looking for generic advice on how to make a tox loader with cues + transitions, something that is likely a common need for most TD users dealing with a playback situation. I’ve done it for live settings before, but there are a few new pre-requisites this time: a looping playlist, A-B fade-in transitions and cueing. Matthew Ragan‘s state machine article (https://matthewragan.com/…/presets-and-cue-building-touchd…/) is useful, but since things get heavy very quickly, what is the best strategy for pre-loading TOXs while dealing with the processing load of an A to B deck situation? Some of suggestions below come from experience building and working on distributed systems, some from single server systems. Sometimes those ideas play well together, and sometimes they don’t. Your mileage may vary here, so like any general advice please think through the implications of your decisions before committing to an idea to implement. The ideas are free, but the problems they make won’t be. Any suggestion / solution here is going to come with trade-offs. There are no silver bullets when it comes to solving these challenges – one solution might work for the user with high end hardware but not for cheaper components; another solution may work well across all component types, but have an implementation limit. I’ll be wrong about some things. The scope of anyone’s knowledge is limited, and the longer I work in ToiuchDesigner (and as a programmer in general) the more I find holes and gaps in my conceptual and computational frames of reference. You might well find that in your hardware configuration my suggestions don’t work, or something I suggest won’t work does. As with all advice, it’s okay to be suspicious. The most crucial part of this process is the planning stage. What you make, and how you think about making it, largely depends on what you want to do and the requirements / expectations that come along with what that looks like. This often means asking a lot of seemingly stupid questions – do I need to support gifs for this tool? what happens if I need to pulse reload a file? what’s the best data structure for this? is it worth building an undo feature? and on and on and on. Write down what you’re up to – make a checklist, or a scribble on a post-it, or create a repo with a readme… doesn’t matter where you do it, just give yourself an outline to follow – otherwise you’ll get lost along or forget the features that were deal breakers. What existing tools do you like – what’s their data structure / solution? How is your data organized – arrays, dictionaries, etc. Do you have a readme to refer back to when you extend your project in the future? Do you have a way to add entries? Do you have a way to recall entries? Do you have a way to update entries? Do you have a way to copy entries? Do you have a validation process in-line to ensure your entries are valid? Take time to think about… time. Silly as it may seem, how you think about time is especially important when it comes to these kinds of systems. Many of the projects I work on assume that time is streamed to target machines. In this kind of configuration a controller streams time (either as a float or as timecode) to nodes on the network. This ensures that all machines share a clock – a reference to how time is moving. This isn’t perfect and streaming time often relies on physical network connections (save yourself the heartache that comes with wifi here). You can also end up with frame discrepancies of 1-3 frames depending on the network you’re using, and the traffic on it at any given point. That said, time is an essential ingredient I always think about when building playback projects. It’s also worth thinking about how your toxes or sub-components use time. When possible, I prefer expecting time as an input to my toxes rather than setting up complex time networks inside of them. The considerations here are largely about sync and controlling cooking. CHOPs that do any interpolating almost always cook, which means that downstream ops depending on that CHOP also cook. This makes TOX optimization hard if you’re always including CHOPs with constantly cooking foot-prints. Providing time to a TOX as an expected input makes handling the logic around stopping unnecessary cooking a little easier to navigate. Providing time to your TOX elements also ensures that you’re driving your component in relationship to time provided by your controller. How you work with time in your TOXes, and in your project in general can’t be understated as something to think carefully about. Whatever you decide in regards to time, just make sure it’s a purposeful decision, not one that catches you off guard. What are the essential components that you need in modular system. Are you working mostly with loading different geometry types? Different scenes? Different post process effects? There are several different approach you might use depending on what you’re really after here, so it’s good start to really dig into what you’re expecting your project to accomplish. If you’re just after an optimized render system for multiple scenes, you might check out this example. When building fx presets I mostly aim to have all of my elements loaded at start so I’m only selecting them during performance. This means that geometry and universal textures are loaded into memory, so changing scenes is really only about scripts that change internal paths. This also means that my expectation of any given TOX that I work on is that its children will have a CPU cook time of less than 0.05ms and preferably 0.0ms when not selected. Getting a firm handle on how cooking propagates in your networks is as close to mandatory as it gets when you want to build high performing module based systems. Some considerations here are to make sure that you know how the selective cook type on null CHOPs works – there are up and downsides to using this method so make sure you read the wiki carefully. Exports vs. Expressions is another important consideration here as they can often have an impact on cook time in your networks. Careful use of Python also falls into this category. Do you have a hip tox that uses a frame start script to run 1000 lines of python? That might kill your performance – so you might need to think through another approach to achieve that effect. Do you use script CHOPs or SOPs? Make sure that you’re being carefully with how you’re driving their parameters. Python offers an amazing extensible scripting language for Touch, but it’s worth being careful here before you rely too much on these op types cooking every frame. Even if you’re confident that you understand how cooking works in TouchDesigner, don’t be afraid to question your assumptions here. I often find that how I thought some op behaved is in fact not how it behaves. What’s your scale? Do you need to support an ever expanding number of external effects? Is there a limit in place? How many machines does this need to run on today? What about in 4 months? Obscura is often pushing against boundaries of scale, so when we talk about projects I almost always add a zero after any number of displays or machines that are going to be involved in a project… that way what I’m working on has a chance of being reusable in the future. If you only plan to solve today’s problem, you’ll probably run up against the limits of your solution before very long. Rather than loading these files on demand, they’re instead stored in this bin and can be selected into their appropriate / needed locations. Similarly, if your tox files are going to rely on a set of assets that can be centralized, consider what you might do to make that easier on yourself. Loading all of these assets on project start is going to help ensure that you minimize frame drops. While this example is all textures, they don’t have to be. Do you have a set of model assets or SOPs that you like to use? Load them at start and then select them. Selects exist across all Op types, don’t be afraid to use them. Using shared assets can be a bit of a trudge to set up and think through, but there are often large performance gains to be found here. Sometimes you have to make something that is dependent on something else. Shared assets are a kind of single example of dependencies – where a given visuals TOX wouldn’t operate correctly in a network that didn’t have our assets TOX as well. Dependencies can be frustrating to use in your project, but they can also impose structure and uniformity around what you build. Chances are the data structure for your cues will also become dependent on external files – that’s all okay. The important consideration here is to think through how these will impact your work and the organization of your project. If you haven’t started writing extensions, now is the time to start. Cue building and recalling are well suited for this kind of task, as are any number of challenges that you’re going to find. In the past I’ve used custom extensions for every external TOX. Each module has a Play(state) method where state indicates if it’s on or off. When the module is turned on it sets of a set of scripts to ensure that things are correctly set up, and when it’s turned off it cleans itself up and resets for the next Play() call. This kind of approach may or may not be right for you, but if you find yourself with a module that has all sorts of ops that need to be bypassed or reset when being activated / deactivated this might be the right kind of solution. In that vein, cultivate a standard. Decide that every TOX is going to get 3 toggles and 6 floats as custom pars. Give every op access to your shared assets tox, or to your streamed time… whatever it is, make some rules that your modules need to adhere to across your development pipeline. This lets you standardize how you treat them and will make you all the happier in the future. That’s a bummer. Looking at this we can tell right away that there might be problems brewing at the circle k – what happens if we mess up our tox loading / targeting and our custom pars can’t get assigned? In this set-up we’ll just fail during execution and get an error… and our TOX won’t load with the correct pars. We could swap this around and include every possible custom par type in our dictionary, only applying the value if it matches a par name, but that means some tricksy python to handle our messy implementation. Okay, so that’s prettier… So what? If we look back at our lesson on dictionary for loops we’ll remember that the pars() call can significantly reduce the complexity of pushing dictionary items to target pars. Essentially we’re able to store the par name as the key, and the target value as the value in our dictionary we’re just happier all around. That makes our UI a little harder to wrangle, but with some careful planning we can certainly think through how to handle that challenge. Take it or leave it, but a good formal structure around how you handle and think about these things will go a long way. I don’t know that I’ve ever met a community of people with such high standards of performance as TouchDesigner developers. In general we’re a group that wants 60 fps FOREVER (really we want 90, but for now we’ll settle), and when things slow down or we see frame drops be prepared for someone to tell you that you’re doing it all wrong – or that your project is trash. Waoh is that a high bar. Lots of things can cause frame drops, and rather than expecting that you’ll never drop below 60, it’s better to think about what your tolerance for drops or stutters is going to be. Loading TOXes on the fly, disabling / enabling containers or bases, loading video without pre-loading, loading complex models, lots of SOP operations, and so on will all cause frame drops – sometimes big, sometimes small. Establishing your tolerance threshold for these things will help you prioritize your work and architecture. You can also think about where you might hide these behaviors. Maybe you only load a subset of your TOXes for a set – between sets you always fade to black when your new modules get loaded. That way no one can see any frame drops. The idea here is to incorporate this into your planning process – having a realistic expectation will prevent you from getting frustrated as well, or point out where you need to invest more time and energy in developing your own programming skills. Richard’s killer post about optimization in touch has an excellent recommendation – keep your UI separate. This suggestion is HUGE, and it does far more good than you might intentionally imagine. I’d always suggest keeping the UI on another machine or in a seperate instance. It’s handier and much more scaleable if you need to fork out to other machines. It forces you to be a bit more disciplined and helps you when you need to start putting previz tools etc in. I’ve been very careful to take care of the little details in the ui too such as making sure TOPs scale with the UI (but not using expressions) and making sure that CHOPs are kept to a minimum. Only one type of UI element really needs a CHOP and that’s a slider, sometimes even they don’t need them. I’m with Richard 100% here on all fronts. That said, be mindful of why and when you’re splitting up your processes. 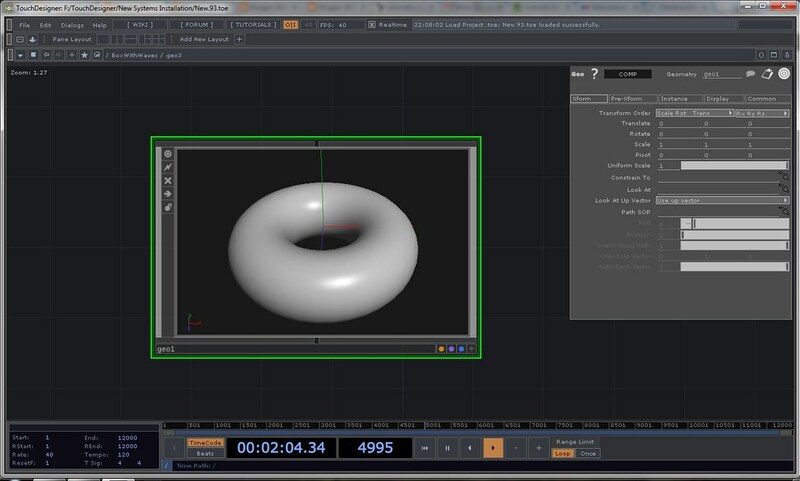 It might be temping to do all of your video handling in one process, that gets passed to process only for rendering 3d, before going to a process that’s for routing and mapping. Settle down there cattle rustler. Remember that for all the separating you’re doing, you need strict methodology for how these interchanges work, how you send messages between them, how you debug this kind of distribution, and on and on and on. How your project starts up matters. Regardless of your asset management process it’s important to know what you’re loading at start, and what’s only getting loaded once you need it in touch. Starting in perform mode, there are a number of bits that aren’t going to get loaded until you need them. To that end, if you have a set of shared assets you might consider writing a function to force cook them so they’re ready to be called without any frame drops. Or you might think about a way to automate your start up so you can test to make sure you have all your assets (especially if your dev computer isn’t the same as your performance / installation machine). It’s not much fun to write a logger, but they sure are useful. When you start to chase this kind of project it’ll be important to see where things went wrong. Sometimes the default logging methods aren’t enough, or they happen to fast. A good logging methodology and format can help with that. You’re welcome to make your own, you’re also welcome to use and modify the one I made. Measure twice, cut once. When it comes to coding, unit tests are where it’s at. Simple proof of concept complete tests that aren’t baked into your project or code can help you sort out the limitations or capabilities of an idea before you really dig into the process of integrating it into your project. These aren’t always fun to make, but they let you strip down your idea to the bare bones and sort out simple mechanics first. Build the simplest implementation of the idea. What’s working? What isn’t? What’s highly performant? What’s not? Can you make any educated guesses or speculation about what will cause problems? Give yourself some benchmarks that your test has to prove itself against before you move ahead with integrating it into your project as a solution. Even though it’s hard – DOCUMENT YOUR CODE. I know that it’s hard, even I have a hard time doing it – but it’s so so so very important to have a documentation strategy for a project like this. Once you start building pieces that depend on a particular message format, or sequence of events, any kind of breadcrumbs you can leave for yourself to find your way back to your original thoughts will be helpful. This entry was posted in How-To, Interactive Installation, Live Performance, media design, Media Installations, Programming, Theory, TouchDesigner on August 7, 2017 by raganmd. At some point while making realtime generative art for massive installations you may find that you’re beyond the capabilities of traditional realtime rendering in Touch. Let’s say, for example, that you need to render 12 hd outputs for a 3 x 4 array of screens – a resolution of 7680 x 3240 certainly can be done with a single render TOP, but delivering that final texture is a little more tricky. I’m well aware that there are a number of possible solutions to this problem but before you find yourself composing that email to me about how to hack a way to a solution… what if it wasn’t 12 ouputs, what if it was 120? 200? What if every output was 4k? The answer we’re really after here is how to draw a scene with consistent perspective across multiple machines… because at some point you’ll have to use multiple machines. So, what do we do? Forget what we do… what does that even look like? I’m still so confused. Okay, so let’s first look at some examples of what it looks like as reference. 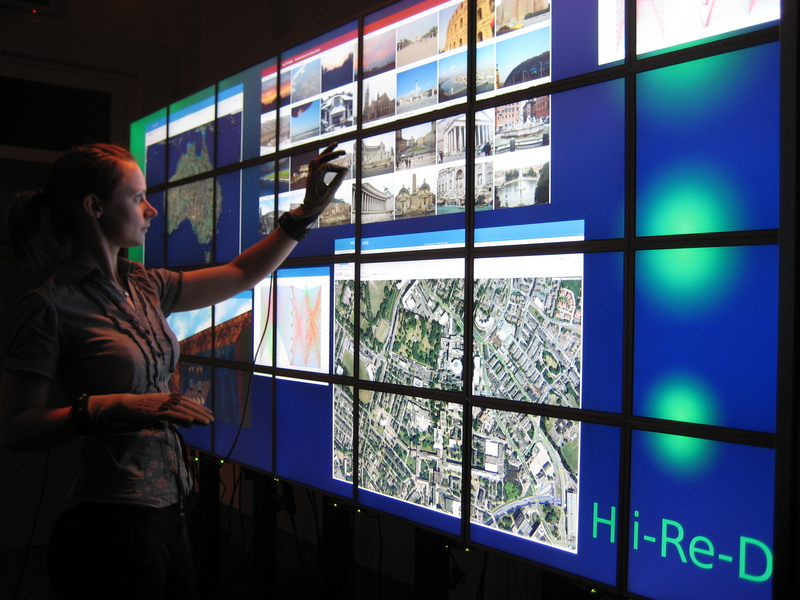 In this example we can see one large canvas that spans multiple screens. This is great – it’s huge and beautiful. This example shows a large desktop, which is also great… but what if we’re after some real-time rendering? This is a great illustration of the problem we might encounter. What if these displays were all 1920 x 1080. It’s a 7 x 4 array, so that’s going to be a definite challenge for a complex scene on a single machine. At this point we probably can’t realistically produce a single pixel to pixel texture for this array on a single machine. Instead we’d have to have a system of distributed rendering machines. Okay, that’s pretty straightforward and we can do some hip flat rendering that’s all orthographic no problem. What if we want perspective? If you want perspective in your real time rendering you need a way to conceptualize what the entire “screen” is, and then how to selectively render just a portion of that larger scene. Consider the beautiful work of Refik Anadol. I can’t speak to exactly what technique is being used here, but it’s a good illustration of the same challenge. How can you maintain the illusion of perspective if you need to render your generative art on multiple machines? That’s the real question we’re trying to answer… and now we can look at some ideas to help us better understand that challenge. The process and methodology described below aim to solve that problem. For this example I’m going to work in a scale that’s unrealistic… but will allow those without a commercial license to play along from home. If you have a commercial license feel free to turn up the resolution as long as you keep mathematics involved in mind. First things first, let’s build out a simple proof of concept that will make sure we understand this problem more completely. Remember, this is just a proof of concept so we’re going to start with a very easy implementation first, before we start to dig into the more complex questions. An important lesson to consider when it comes to programming is to start by reducing the problem to its basic elements, then when you have a foundational understanding of the issue start to scale up – don’t worry, we’ll get there we just have to start small. 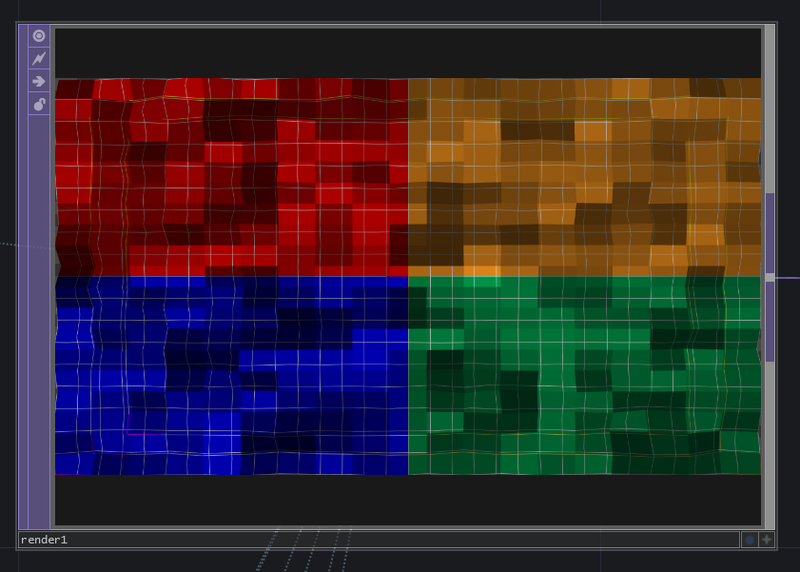 Okay, so we’ve got our 2 x 2 array that we want to render. Let’s see how we can set up some cameras to render just one of those squares a piece, but all from the same point of view. Wait! Why do they need the same point of view? We’re after the same point of view so we can maintain perspective. It’d be easy enough to use four different cameras that were translated into positions to only see their section of the larger quad, but the results from lighting and perspective calculations wouldn’t match. You can use this multi-camera transformation technique if you’re doing orthographic rendering with emissive lighting, but not if you want to maintain perspective and use non-emissive lighting. It’s okay if you don’t believe me – I didn’t believe me either, and I had to set it up and test it bunch of times before I really understood what’s happening. Eventually, we want to reassemble the view of four cameras to look like our original single camera view. Matt, I still don’t get it. That’s okay. Keep reading, and if by the time we get done with this example it’s still not a useful technique you can stop reading. If, however, you want a means to do perspective based illusions across multiple machines for massive installations, keep reading to the end. We’re going to set up our test by by using a part of our camera COMP that you may not have used before. 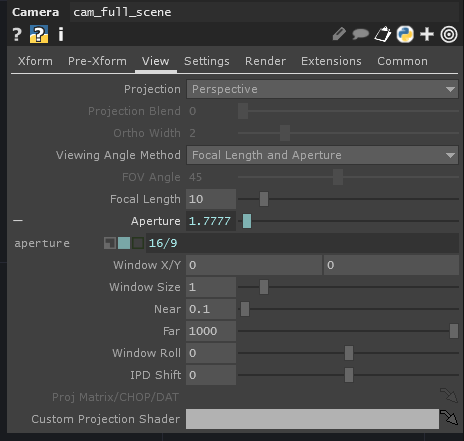 Specifically, when it comes to the view page, we’re going to use the Viewing Angle and Method called “Focal Length and Aperture.” I wish I could tell you exactly what this means to TouchDesigner – spoiler, I can’t – what I can help you understand is how these values relate to one another in order to achieve our particular illusion. Whew. Alright, now we can finally get to the interesting part. Let’s add a light and a camera to our network. If we were to bypass our noise SOP the view of this piece of geometry would fit exactly within our view-port. From here forward it’s going to get a little interesting. We want to maintain the perspective calculations from this vantage point, but we want only a single quadrant at a time to fill our view-port. It’s almost like zooming in and cropping to only a sub-section of our view. How do we do that? We’re also going to change our window size to be 0.5. Okay. That’s all pretty slick, but how do all of these parameters relate? The meat and potatoes of this technique is to define a view-port’s aspect ratio, the number of vertical slices that a single window represents, and then to specify where the offsets sit that represent the center of a given window. Let’s think through our simple example. We made our rendered quad a 1.7778 x 1 rectangle – a rectangle with a 16:9 aspect ratio. This was the same value we used for our aperture. We also set the distance of our camera from our geo to be 10 units, which was the same value we used to define our focal length. 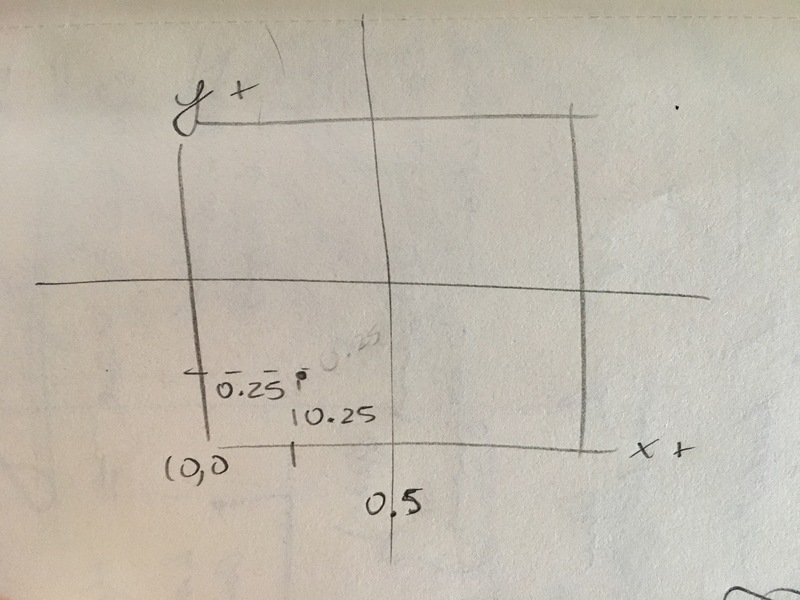 The window size is a ratio of 1 over the number of vertical sections… in our case we had two vertical sections, so 1 over 2 is 0.5. Our xy window offsets represent the center of our windows in our sections. 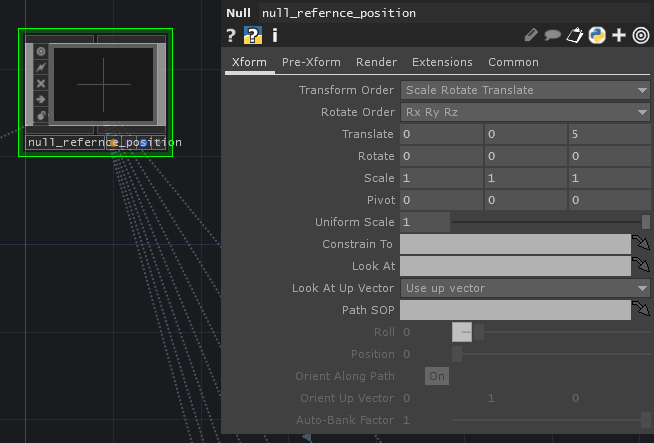 That’s a little harder to wrap our heads around, and a better way to think about it is the UV coordinates of the center of a given window into our scene. Let’s break that out a little more. Well, let’s imagine that you’re working on a large format LED installation where you need to slice up your scene into uniform HD chunks that then feed an LED controller. In some cases those regions overlap even though only a single LED screen is outputting the content. Relationally, however, you still need to be able to control and designate the regions for the screens. Output 5 and 7 are a good example of these. The final shape of that screen is going to be the combined outline of the two displays, but the video feed to the LED controllers needs to be consistent HD cutouts. All of the dimensions in this example could probably be managed by doing a single rendering of the full scene then cropping to a given region – but at some point your ability to render the full scene and then use TOPs to crop out pixels is going to fail. This example has 7 outputs, but it’s not hard to imagine a project that had 20 or more – as reference, the need to understand this technique came out of working on an installation with 68 discrete outputs. Okay, okay, okay… fine. So what are all these targets and numbers about? We’ll remember in our first proof of concept example that we were able to take advantage of a simple 0.25 offset – that makes sense right? Looking at this, it should make sense why we used the translation coordinates that we did. The other interesting thing to understand in this look into our geometry is to consider the following. 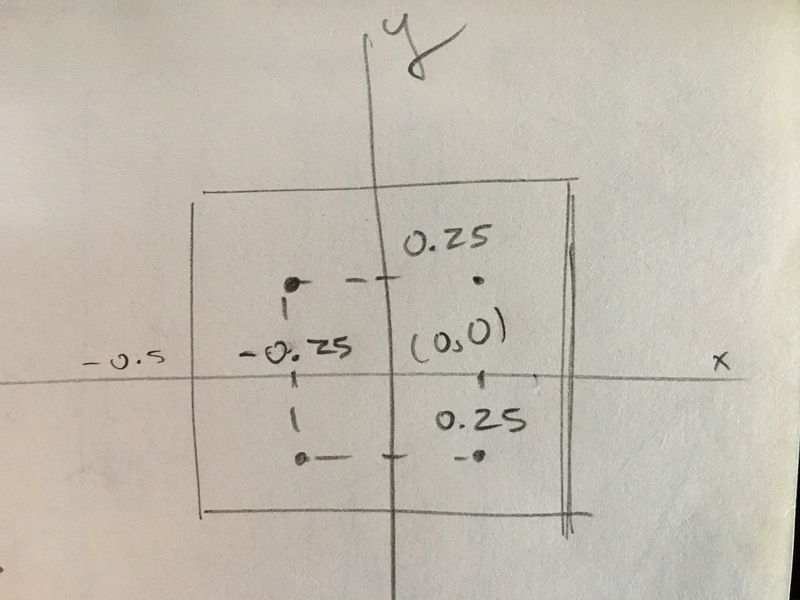 If the full extent of our scene represents the bounds of a complete window, then we can begin to think about our winx and winy coords as being more akin to a UV – a normalized coordinate on our full window. We need to do some additional math to compensate for the translation of our origin, but that’s pretty straightforward. If you’re still scratching your head, that’s okay. Let’s look at how to take our new window map and create a programmatic means of slicing up that full scene. We need the transforms for all our cameras to be the same – these are on the xform page: tx, ty, tz. Given that our cameras aren’t going to be doing any moving once we set up our calibration, we can safely use python expressions in our parameter fields. In terms of optimization, if an op does a lot of cooking it’s often better to use exports instead of expressions – expressions end up getting complied on demand and evaluated when op op cooks. 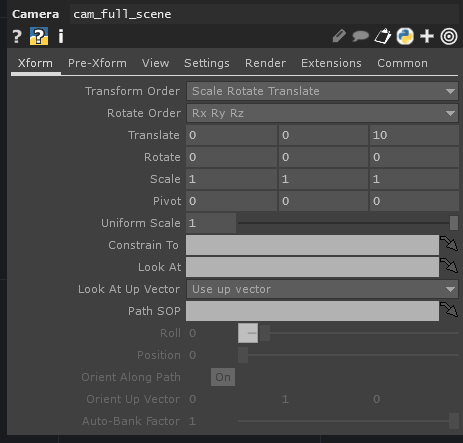 Since we want fixed cameras looking into a moving world, we can use expressions for our cameras – it’s also going to be less of a hassle to set up, which is great. For starters let’s add our reference template into our scene. We can start by dragging in our texture, connecting a Null TOP, and then assigning this to the color of a constant Material. Next let’s add a geometry to our scene. We can replace the torus inside with a rectangle that has our source window’s aspect ratio, which in this case is 16:9 or 1.778 : 1. Next I’m going to use a Null COMP to hold the transforms of our camera system. I’m going to set this to have a tz value of 5, and otherwise leave this alone. Let’s also add an object CHOP to help us with determining the distance between the null and geometry – to be clear, we don’t need to do this with an object CHOP, we could do this with a math CHOP, or with Python. 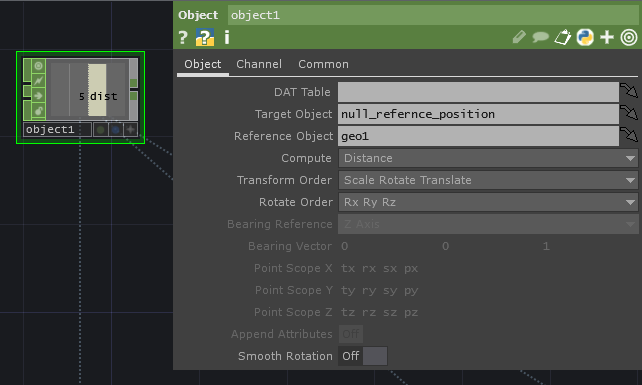 In the Object CHOP I’m going to set our null as the target object, geo1 as the reference object, and I’m going to set this to compute distance. I’m also going to add some tables that hold some reference information for us. I want to know the width and height of our scene, as well as the width and height of a given cut-out. Now that we have all our primary ingredients ready, we can build out a system to convert our pixel space coordinates into a set of winx and winy translation values. 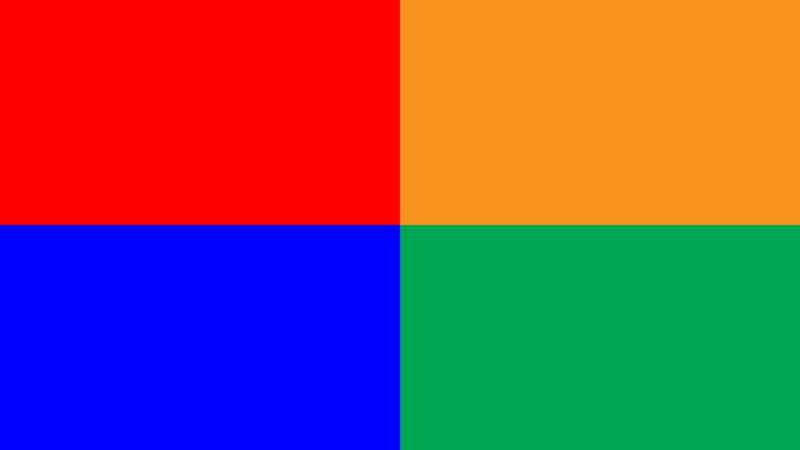 These values represent the actual center of these windows in the full pixel scene. I started by making this template in Photoshop, and then measured the location of the center of each given viewport. Our results from this can be found in the table below. Now that we have the UV coords that represent the center of each window, we need to convert these values into a scale that takes into account that the center of our geometry is located at the origin. For our x values we multiply our value by 2, subtract 1, and divide by 2. For our y values we use the same operation and multiply by negative 1. We can use another eval DAT to do just this for us. Now we have taken our original pixel coords and then converted them into our winx and winy transforms. With these values set, we just need to make sure that we compute our window size, aperture, and focal_length. 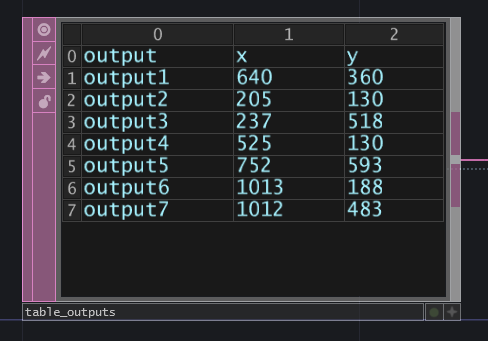 Looking back to the above, calculating these remaining values should be a snap. Window size is 1 over the number of windows that can fit into our full scene. 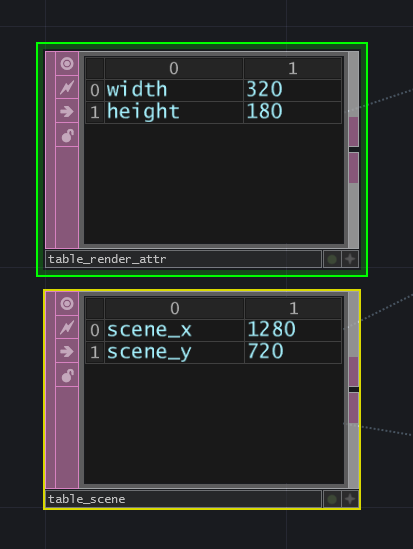 This also means that our total scene’s width should be n x the width of a given window. In our case a single window (measured in Photoshop) is 320 pixels, and our full scene is 1280 pixels. 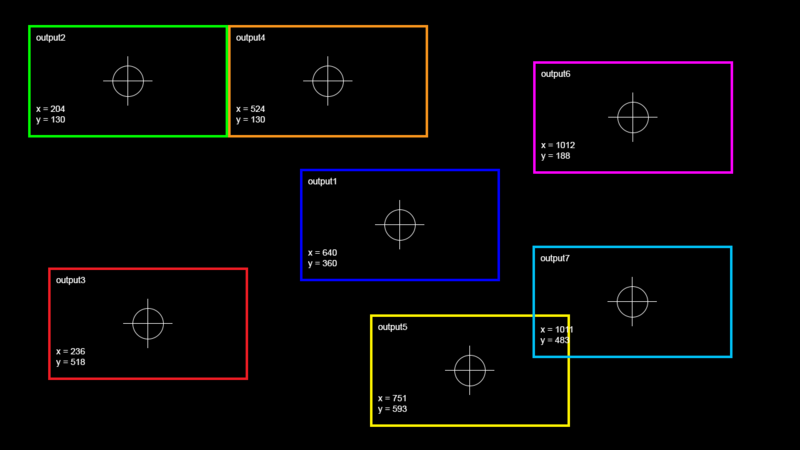 Focal Length is the distance between our point of view (in our case the null), and our full scene. We’ve used an object CHOP to compute this distance. Our aperture is the aspect ratio of our full scene. Python in touch is name dependent, so I’d recommend looking at this example network if you’re trying to replicate this effect. Now we can set up our cameras to correctly crop out a given viewport of the entire scene. I’m going to rely on the digits of a camera to be correspondences to the output. So in my case output1 and camera1 should be the same thing. I’m also going to use the translation values of our null to set the location of the camera. Again, all of our expressions are name dependent, so I’d recommend looking over how I’ve organized this in the sample file in order to make sure you know exactly what’s referencing what. Now we can copy past our camera 6 more times – I’m using digits in many of these expressions to match the camera digit to the output digit. Looking over my results it looks like we’re right on the money. To really appreciate what’s happening here, I’m going to turn off the rendering on our calibration plate, and turn on a sample piece of geometry. In geo2 you can see the entire geometry, and in each of our viewports we can see that we’re only rendering the region of our geometry that falls into single view. Hopefully, doing this we should better be able to see how these various pieces work together. At this point we now have a means of rendering a complex scene across multiple machines (or GPUs if you’re able to use affinity on Quadro cards), and maintain perspective. That unlocks a whole new avenue for realtime rendering that breaks you away from the limitations of single machine configurations or reliance on baked media for distributed realtime rendering. It’s always lovely to get an email from Derivative headquarters. 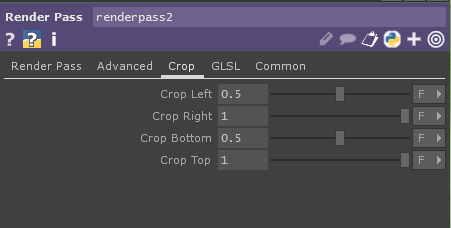 In this case I just got a lovely ping from Malcolm to let me know that the crop parameters on the render TOP can be used for the same functions described above. As we add additional render pass tops we need to target the previous render pass – a given render or render pass TOP can only have a single render pass assigned to it. Here the result is the same, the methodology going into it all is just a little different. 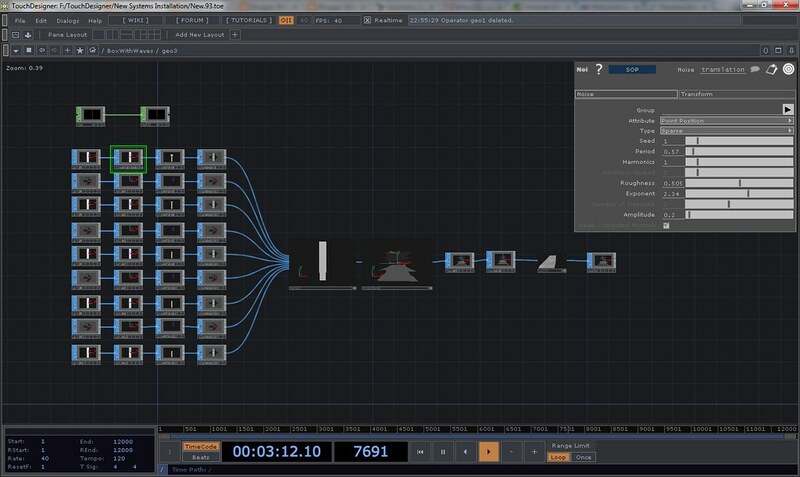 Like all things TouchDesigner, there are multiple means of solving the same challenge and the “right” one ultimatly comes down to the choice that’s best for your particular installation. * The git repository and support files have been updated to reflect this additional material. 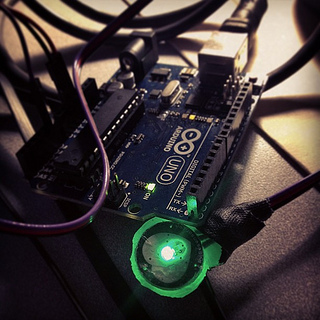 This entry was posted in How-To, Installation, Interactive Installation, Programming, TouchDesigner and tagged cameras, Realtime rendering, TouchDesigner, virtual cameras on December 13, 2016 by raganmd. 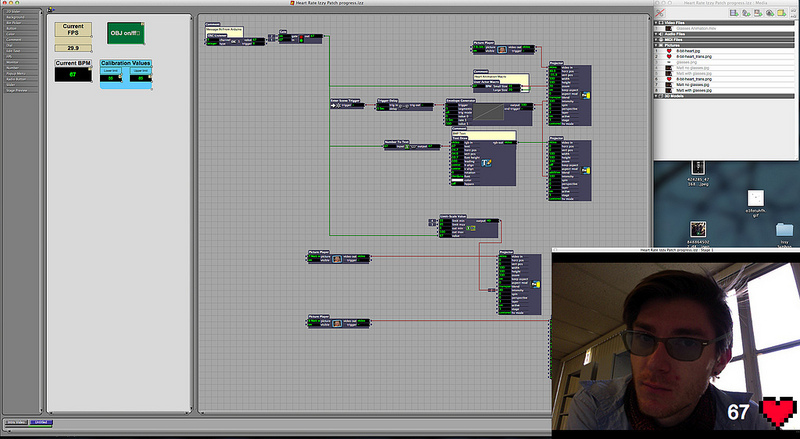 One of the benefits of working with TouchDesigner is the ability to work in 3D. 3D objects are in the family of operators called SOPs – Surface Operators. One of the aesthetic directions that I wanted to explore was the feeling of looking into a long box. The world inside of this box would be characterized by examining artifacts as either particles or waves with a vaguely dual-slit kind of suggestion. With that as a starting point I headed into making the container for these worlds of particles and waves. 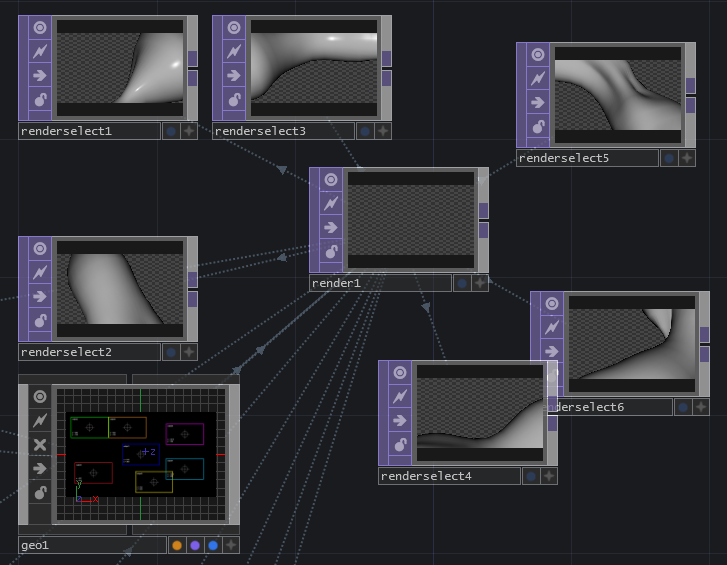 Before making any 3D content it’s important to know how TouchDesigner processes these objects in order to display them. On their own, Surface Operators can’t be displayed as a rendered texture. 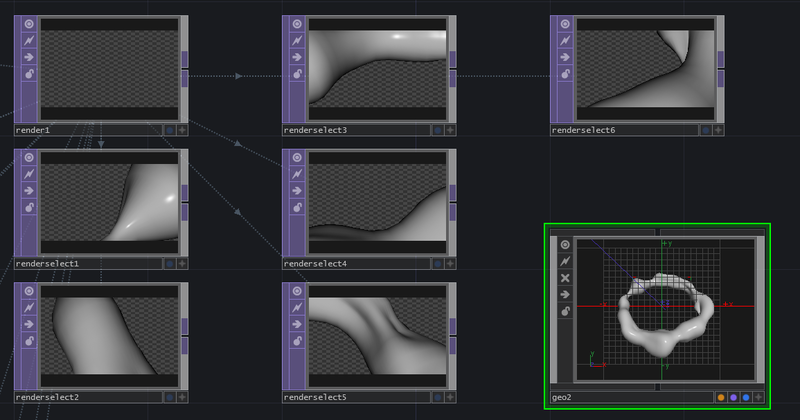 In TouchDesigner’s idiom textures are two-dimension surfaces, and it follows that the objects that live in that category are called TOPs, Texture Operators. Operators from different families can’t be directly connected with patch chords. In order to pass the information from a SOP to a TOP one must use a TOP called a Render. The Render TOP must be connected to three COMPs (Compositions) in order to create an image that can be displayed. The render TOP requires a Geometry COMP (something to be rendered), a Light COMP (something to illuminate the scene), and a Camera COMP (the perspective from which the object is to rendered). In this respect TD pulls from conventions familiar to anyone who has worked with Adobe’s After Effects. Knowing the component pieces required in order to successfully render a 3D object it’s easier to understand how I started to create the underlying geometry. The Geometry COMP is essentially a container object (with some special attributes) that holds the SOPs responsible for passing a surface to the Render TOP. The default Geometry COMP contains a torus as a geometry. We can learn a little about how the COMP is working by taking a look inside of the Geometry object. Here the things to pay close attention to are the two flags on the torus object. You’ll notice in the bottom right corner there is a purple and a blue circle that are illuminated. 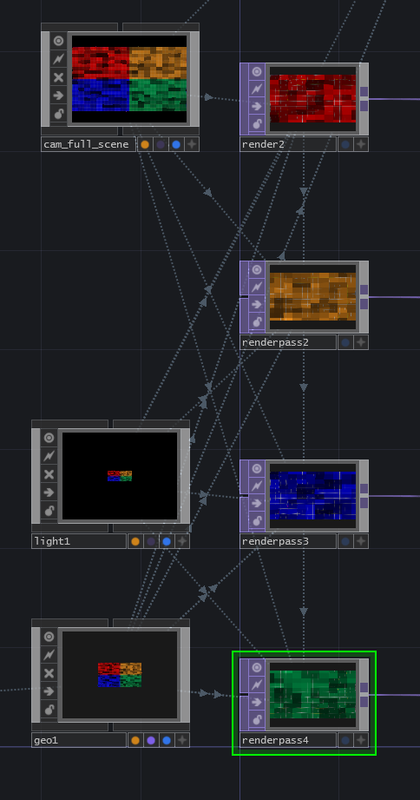 The purple circle is a “Render Flag” and tells TouchDesigner to render the object, and the blue circle is a “Display Flag” which tells TouchDesigner that this is the object that should be displayed in the Geometry COMP. Let’s take a look at the network that I created. Now let’s dissect how my geometry network is actually working. At first glance we can see that multiple objects are being combined into a single piece of geometry that’s ultimately being passed out of this Geometry COMP. Grid creates a plane that’s created out of polygons. This is different from a rectangle that’s only composed four points. In order to create a surface that can deform I needed a SOP points in the middle of it. 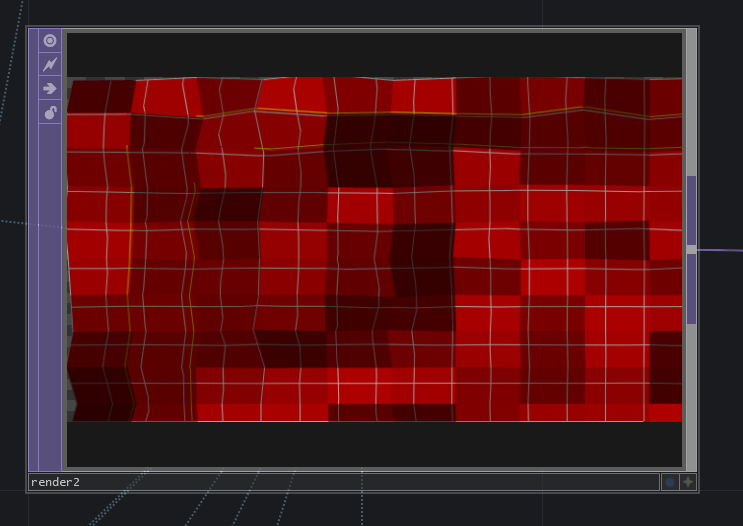 The grid is attached to a Noise SOP that’s animating the surface. Noise is attached to a transform SOP that allows me to change the position of this individual plane. The last stop in this chain is another Noise SOP. Originally I was experimenting with varying the transparency of the surface. Ultimately, I decided to move away from this look. Rather than cutting this out of the chain, I simply turned on the Bypass Flag which turns off this single SOP. This whole chain is repeated eight times (for a total of eight grids). 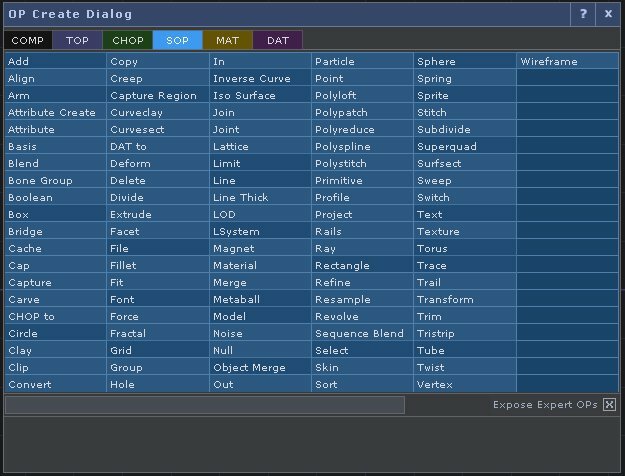 Merge takes all of the inputs and puts them together into a single piece of geometry. 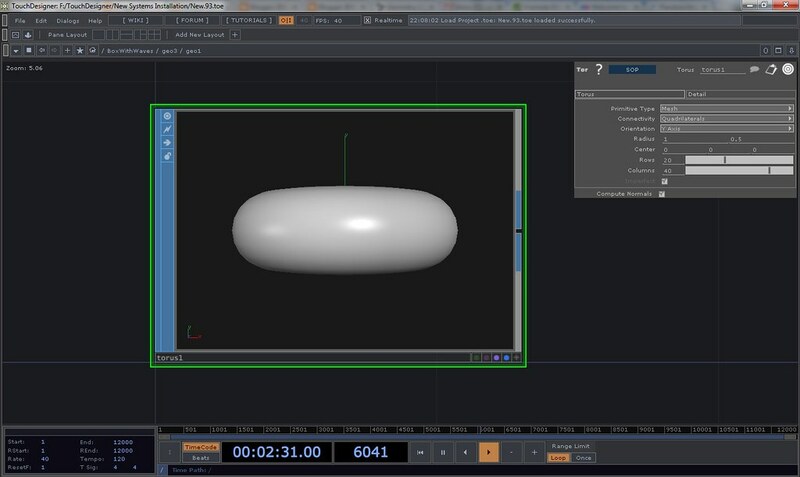 Transform allows me to move object as a whole in space. Facet is a handy operator that allows you to compute the normals’ of a geometry, which is useful for creating some more dynamic shading. Texture was useful for another direction that I was exploring, ultimately ended up turning on the bypass flag for this SOP. A null, like in other environments, is really just a place holder kind of object. 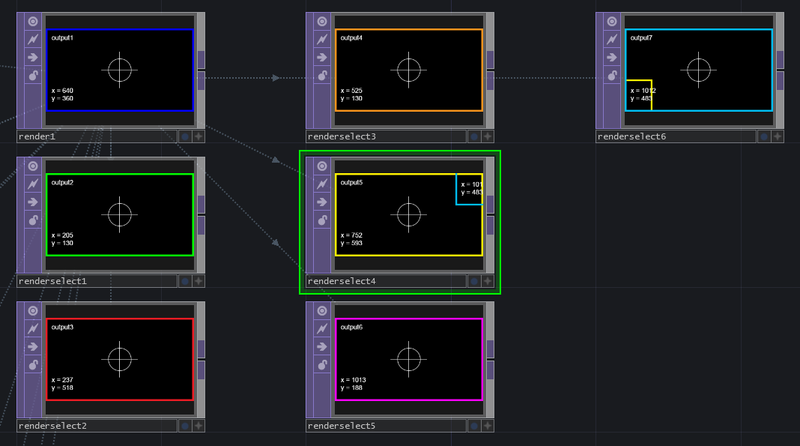 In the idiomatic structure of TouchDesigner, the Null is operationally an object that one places at the end of operation string. This is considered a best practice for a number of reasons. High on the list of reasons to end a string in a Null is because this allows easy access for making changes to a string. 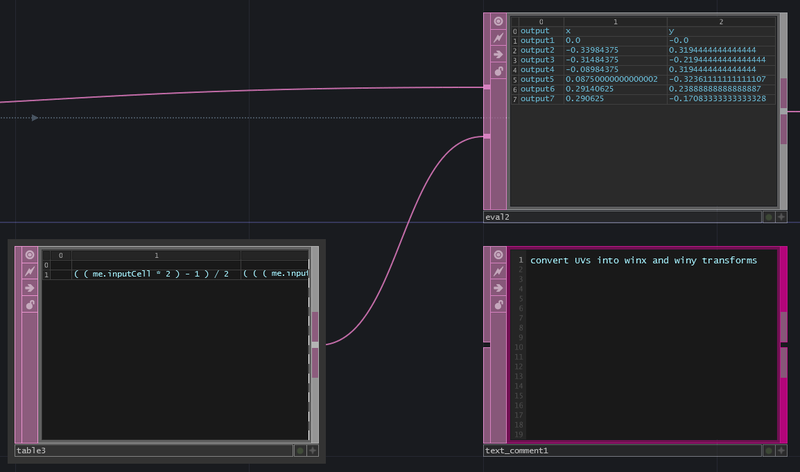 TouchDesigner allows the programmer to insert operations between objects. By always ending a string in a Null it becomes very easy to make changes to the stream without having to worry about re-exporting parameters. Finally all of this ends in an Out. While the Out isn’t necessary for this string, at one point I wasn’t sure if I was going to pass this geometry into another component. Ending in the Out ensured that I would have that flexibility if I needed it. This entry was posted in Installation, Interactive Installation, TouchDesigner and tagged Arizona, Arizona State University, ASU, AZ, Derivative, graduate school, media design, Media Installations, TouchDesigner on April 22, 2013 by raganmd. Last semester Boyd Branch offered a class called the Theatre of Science that was aimed at exploring how we represent science in various modes expression. Boyd especially wanted to call attention to the complexity of addressing issues about how todays research science might be applied in future consumable products. As a part of this process his class helped to craft two potential performance scenarios based on our discussion, readings, and findings. One of these was Neuro, the bar of the future. Take a cue from today’s obsession with mixology (also called bartending), we aimed to imagine a future where the drinks your ordered weren’t just booze filled fun-times, but something a little more insipidly inspiring. What if you could order a drink that made you a better person? 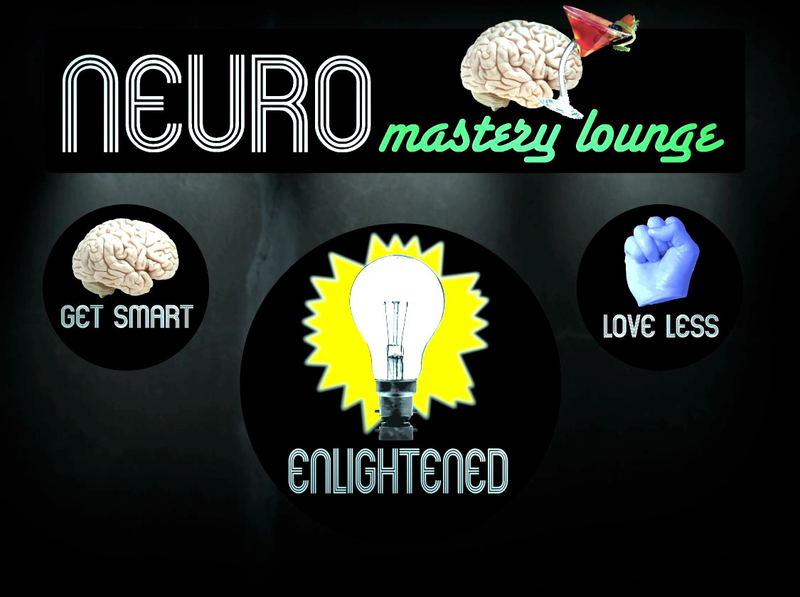 What if you could order a drink that helped you erase your human frailties? Are you too greedy, have specialty cocktail of neuro-chemicals and vitamins to help make you generous. Too loving or giving, have something to toughen you up a little so you’re not so easily taken advantage of. With this imagined bar of the future in mind, we also wanted to consider what kind of diagnostic systems might need to be in place in order to help customers decide what drink might be right for them. Out of my conversations with Boyd we came up with a station called the De-Objectifier. The goal of the De-Objectifier is to help patrons see what kind of involuntary systems are at play at any given moment in their bodies. The focus of this station is heart rate and it’s relationship to arousal states in the subject. While it’s easy to claim that one is impartial and objective at all times, monitoring one’s physiology might suggest otherwise. Here the purpose of the station is to show patrons how their own internal systems make being objective harder than it may initially seem. A subject is asked to wear a heart monitor. The data from the heart monitor is used to a calibrate a program to establish a resting heart rate and an arousal threshold for the individual. The subject is then asked to view photographs of various models. As the subject’s heart rate increases beyond the set threshold the clothing on the model becomes increasingly transparent. At the same time an admonishing message is displayed in front of the subject. The goal is to maintain a low level of arousal and to by extension to master one physiological aspect linked to objectivity. So how does the De-objectifier work?! The De-objectifier is built on a combination of tools and code that work together to create the experience for the user. The heart monitor itself is built from a pulse sensor and an Arduino Uno. (If you’re interested in making your own heart rate monitor look here.) The original developers of this product made a very simple processing sketch that allows you to visualize the heart rate data passed out of the Uno. While I am slowly learning how to program in Processing it is certainly not an environment where I’m at my best. In order to work in an programming space that allowed me to code faster I decided that I needed a way to pass the data out of the Processing sketch to another program. 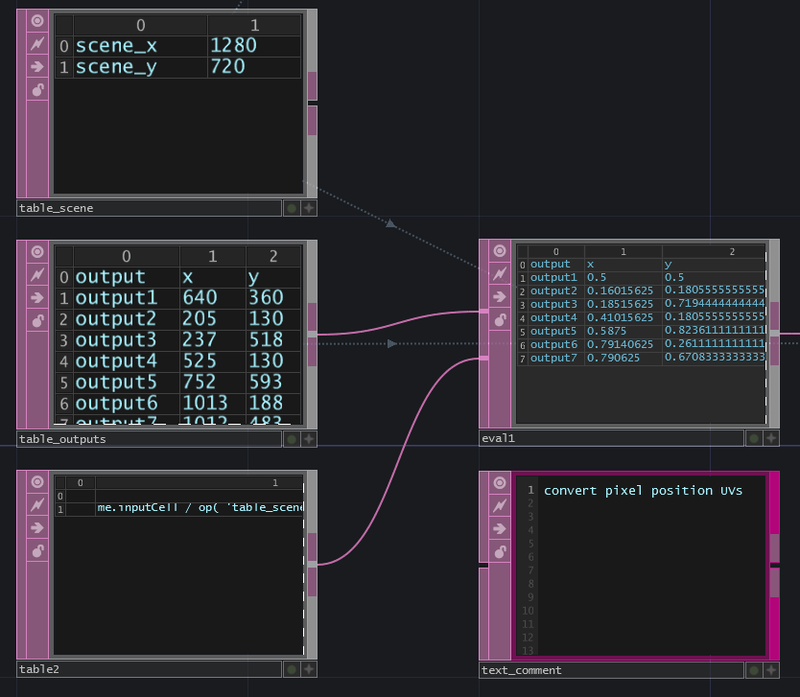 Open Sound Control is a messaging protocol that’s being used more and more often in theatrical contexts, and it seemed like this project might be a perfect time to learn a little bit more about OSC. 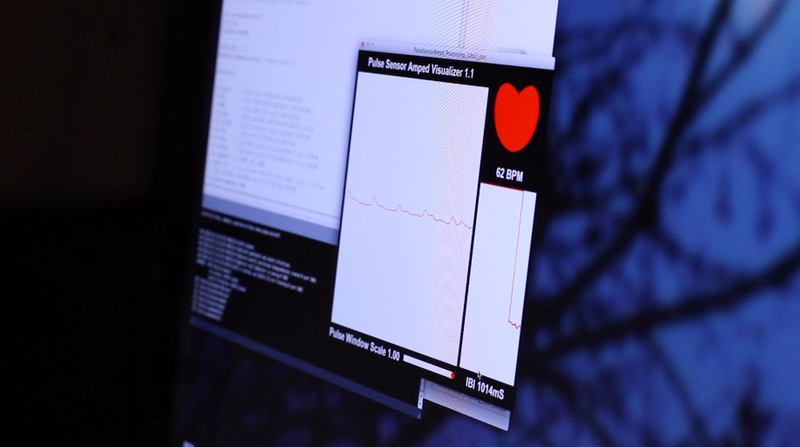 To pass data over OSC I amended the heart rate processing sketch and used the Processing OSC Library written by Andreas Schlegel to broadcast the data to another application. Ultimately, I settled on using Isadora. While I started in MaxMSP, I realized that for the deadlines that I needed to meet I was just going to be able to program faster in Isadora than in Max. This was a hard choice, especially as MaxMSP is quickly growing on me in terms of my affection for a visual programming language. I also like the idea of using Max because I’d like the De-objectifier to be able to stand on its own without any other software and I think that Max would be the right choice for developing a standalone app. That said, the realities of my deadlines for deliverables meant that Isadora was the right choice. My Isadora patch includes three scenes. The first scene runs as a pre-show state. Here an motion graphic filled movie plays on a loop as an advertisement to potential customers. The second scene is for tool calibration. Here the operator can monitor the pulse sensor input from the arduino and set the baseline and threshold levels for playback. Finally there’s a scene that includes the various models. The model scene has an on-off toggle that allows the operator to enter this mode with the heart rate data not changing the opacity levels of any images. Once the switch is set to the on position the data from the heart rate sensor is allowed to have a real-time effect on the opacity of the topmost layer in the scene. Each installation also has an accompanying infomercial like trailer and video vignettes that provide individuals with feedback about their performance. Here Boyd described the aesthetic style for these videos as a start-up with almost too much money. It’s paying your brother-in law who wanted to learn Premiere Pro to make the videos. It’s a look that’s infomercial snake-oil slick. Couples at the De-Objectifier were some of the best participants to observe. Frequently one would begin the process, and at some point become embarrassed during the experience. Interestingly, the person wearing the heart rate monitor often exhibited few visible signs of anxiety. The direct user was often fixated on the screen wearing a gaze of concentration and disconnection. The non-sensored partner would often attempt to goad the participant by using phrases like “oh, that’s what you like huh?” or ” you better not be looking at him / her.” The direct user would often not visible respond to these cues, instead focusing on changing their heart rate. Couples nearly always convinced their partner to also engage in the experience, almost in a “you try it, I dare you” kind of way. Groups of friends were also equally interesting. In these situations one person would start the experience and a friend would approach and ask about what was happening. A response that I frequently heard from participants to the question “what are you doing?” was “Finding out I’m a bad person.” It didn’t surprise users that their heart rate was changed by the images presented to them, it did surprise many of them to see how long it took to return to a resting heart rate as the experience went on. Families were also very interesting to watch. Mothers were the most likely family member to go first with the experience, and were the most patient when being goaded by family members. Fathers were the least likely to participate in the actual experience. Generally participants were surprised to see that actual heart rate data was being reported. Many thought that data was being manipulated by the operator. This entry was posted in Installation, Interactive Installation and tagged arduino, Arizona, Arizona State University, art, ASU, composite, graduate school, heart rate, Live Performance, MAX, media design, Media Installations, Processing, programming, projection mapping, sensors on February 26, 2013 by raganmd.